• Central Processing Unit (CPU) - CPU is also a microprocessor. Its purpose is to fetch binary coded instructions from memory, decode the fetched instructions and generate the control signals required to execute the instructions. It contains arithmetic logic unit (ALU), which can perform add, subtract, OR, AND, invert and exclusive-OR operations on binary words. • Memory and Input/output Interfacing - The most of the microprocessors support isolated I/O system. It partitions memory from I/O via software, by having instructions that specifically access (address) memory, and others that specifically access I/O. When these instructions are decoded by the microprocessor, an appropriate control signal is generated to activate either memory or I/O operations. • Memory Classification - Memory is basically classified into two types- Volatile Memory (contents are erased if power is turned off) and Non-Volatile Memory (contents are not erased even if power is turned off). • Primary Memory & Secondary Memory - Primary memory is also called main memory. Before processing the data, information or programs are first stored in internal memory called main memory. Secondary memory is the memory of permanent nature where the data or information is stored in large volume. • Static & Dynamic Memory - Static memory devices are semiconductor memories in which the stored data will remain permanently stored as long as power is applied without the need of periodically rewriting or refreshing the data into the memory. Dynamic memory devices are semiconductor memories in which the stored data will not permanently stored even with power applied unless the data is periodically rewriting or refreshing the data into the memory. • Logical & Virtual Memory - Logical memory is the address space, assigned to a logic partition, that the operating system perceives as it's main storage. For a logical partition that uses shared memory, a subset of the logical memory is backed up by physical main storage and the remaining logical memory is kept in auxiliary storage. Virtual memory is simply the operating system using some amount of disk space as if it were real memory. If a computer lacks RAM needed to run a program or operation then windows uses virtual memory to compensate. Virtual memory combines the computer's RAM with temporary space on hard disk. I. Cache Memory - It is a high speed semiconductor memory which can speed up CPU. It is used to hold those parts of data and program which are more frequently used by CPU. It is expensive with limited capacity. II. Primary Memory - It holds only those data and instructions on which computer is currently working. It has limited capacity and data is lost when power is switched off. It is faster than secondary memory. III. Secondary Memory - This type of memory is known as external or non-volatile memory. It is slower than main memory. These are used to store data permanently. Contents of secondary memories are first transferred to main memory, and then CPU can access it. Strobe (CAS) latency. The latency is dependent upon number of clock ticks instead of arbitrary time. takes the head assembly on the actuator arm to travel to the track of the disk where data will be read or written. 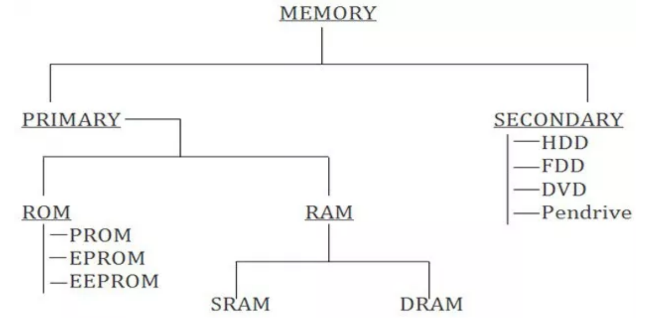 • Memory Hierarchy - It is an organization of memories available in computer. It consist of all storage devices from the high capacity secondary memory to a low capacity main memory to an even smaller and faster cache memory accessible to high speed processing. 1.Static RAM: It consists of number of flip-flops. Each flip-flop stores one bit. As long as power is applied, the flip-flop remains latched and can store the bit indefinitely. Static RAM contains less memory cells per unit area. It has less access time, hence faster memories. Refreshing circuitry is not required. But, its cost is more. 2.Dynamic RAM: It stores the data as a charge on the capacitor. When sense and control lines go high, the MOSFET conducts and charges the capacitor. When sense and control lines go low, the MOSFET opens and retains the capacitor. Dynamic RAM contains more memory cells as compared to static RAM per unit area. It's access time is greater than static RAM. The disadvantage of dynamic RAM is that it needs refreshing of charge on the capacitor after every few milliseconds. This complicates the system design, since it requires the extra hardware to control refreshing of dynamic RAM's. 1.Masked ROM: The very first ROMs, known as Masked ROMs, were hard-wired devices that contained a pre-programmed set of data or instructions. The contents of such ROMs had to be specified before chip production so the actual data could be used to arrange transistors inside the chip. 2.Programmable ROM (PROM): Creating a ROM chip from scratch is a time-consuming and expensive process. Due to this, PROM was created which can be programmed. Blank PROM chips can be bought economically and coded by the users. However, once a PROM has been programmed, its content can never be changed. As a result, PROM is also known as one-time programmable (OTP) device. 3.Erasable Programmable ROM (EPROM): An EPROM is programmed in exactly the same manner as a PROM. However, unlike PROM, as EPROM can be erased and reprogrammed repeatedly. It can be erased by simply exposing the device to a strong source of ultraviolet light for a certain amount of time. An EPROM eraser is not selective, it will erase the entire EPROM. Although it is more expensive than PROM, its ability to be reprogrammed makes it more useful. 4.Electrically Erasable Programmable ROM (EEPROM): This type of ROM can be erased by an electrical charge and then written to by using slightly higher than normal voltage. EEPROM can be erased one byte at a time, rather than erasing the entire chip with ultraviolet light. Hence, the process of re-programming is flexible, but slow. As these chips can be changed without opening a casing, they are often used to store programmable instructions in devices like printers. 5.Flash ROM: A flash ROM also called flash BIOS or flush memory, is a type of constantly powered non-volatile memory that can be erased and reprogrammed in blocks. It is a variation of EEPROM, which unlike flash memory, is erased and rewritten at the byte level. Flash memory gets its name because the microchip is organised so that a section of memory cells are erased in a single action or 'flash'. Flash memory is used in digital cellular phones, digital cameras and other devices. • PAL: The Programmable Array Logic (PAL) device is composed of a programmable array of AND gates and a fixed array of OR gates. The size of the array and the number of inputs and outputs upon the specific devices. By selectively blowing fuses in AND array, we can create a required logic in the form of a sum of products expression. The programmable array logic provides high performance at lower cost and size. • PLA: The Programmable Logic Array (PLA) is composed of a programmable array of AND gates and a programmable of OR gates, thereby offering maximum programming flexibility. In the PLA devices fuses can be blown on the AND array and on the OR array in order to achieve a required logic function. The PLA device offers more flexibility than is generally required for most application and so is used less frequently than the PAL.